This might be Mickey's greatest role yet! The eager mouse stands at attention, ready to take the stage as the iconic Nutcracker. 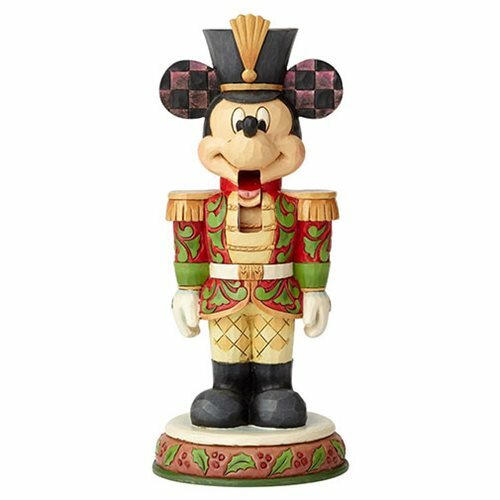 Handcrafted and hand painted, the timeless Disney Traditions Mickey Mouse Nutcracker Stalwart Soldier Statue by Jim Shore features Shore's signature folk art motifs and playful use of color. Its 7-inch tall design is sculpted from high-quality polyresin and calcium carbonate for a lifetime of love. Order the Disney Traditions Minnie Mouse Nutcracker Statue and Disney Traditions Donald Duck Nutcracker Statue (each sold separately) for a truly show-stopping holiday display! The Disney Traditions collection by Jim Shore combines the magic of Disney with the time-honored motifs of folk art.